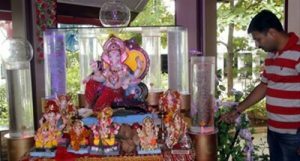 Pimple Saudagar: A Pimple Saudagar-based housing society, Roseland Residency, has displayed an affordable method to purify water, this Ganesh festival. The housing society has been inspired by the Sarva Jal Abhiyan, an initiative of the Delivering Change Foundation of the Sakal Media Group, which aims at putting an end to water woes and making Maharashtra drought-free in the next five years. 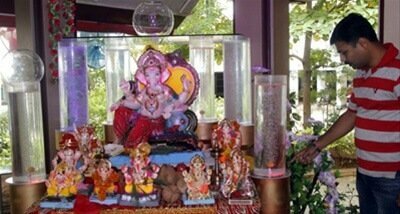 The housing society has decorated its Ganesh idol with glass cylinders filled with water. Acrylic pipes were used in the set up of the cylinders. The set up also demonstrates how the hardness of water can be brought down by the use of simple methods. Acrylic pipes are used in this set up and about eight litres of water can be made potable within six hours of bubbling. The team that manages the Ganesh Festival includes Chandan Chourosiya, Prashant Khairnar and Santosh Maskar.